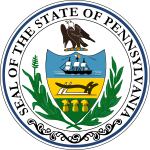 The 1875 United States Senate election in Pennsylvania was held on January 19, 1875. William A. Wallace was elected by the Pennsylvania General Assembly to the United States Senate. ^ a b "U.S. Senate Election - 19 January 1875" (PDF). Wilkes University. Retrieved 23 December 2012. ^ "PA US Senate - 1875". OurCampaigns. Retrieved 22 December 2012. This page was last edited on 15 December 2018, at 22:55 (UTC).